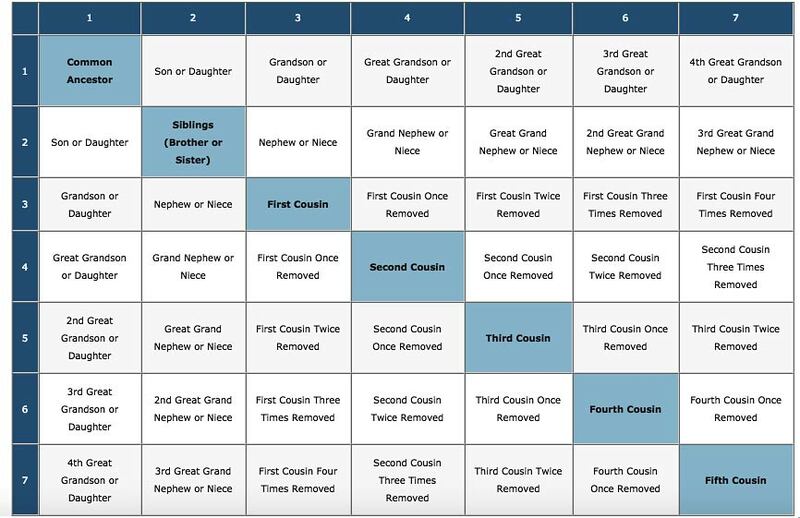 “Just how are we related again?” It’s a common question, especially when you get to the second-cousin once removed stage. The chart below offers an at-a-glance look at family relationships. Common usage allows the Great Aunt-Uncle and Great Nephew-Niece to be referred to as Grand Aunt-Uncle or Grand Nephew-Niece. Although an allowable usage, it is not the preferred usage. Here’s another way to figure out how you and a relative are related. Look at the top row of the chart (in blue) and find the first person’s relationship to the common ancestor. Look at the far left column of the chart (in blue) and find the second person’s relationship to the common ancestor.